It’s official, it exists! 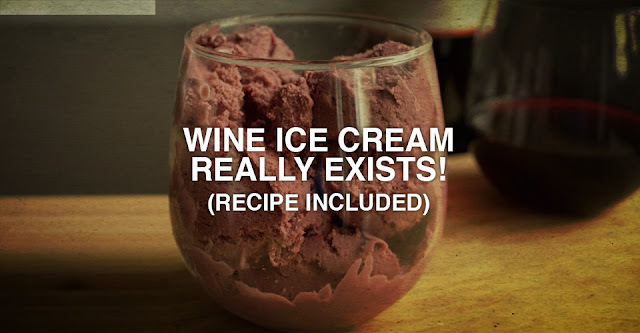 Wine Ice-cream. A combination almost every woman dreams of. No need to take a tub of ice-cream and a glass of wine into the bathroom any more for ‘me’ time! This little mood lifter is now combined into one delicious ice-cold snack! I, for one am super delighted. American food producer The Crossroad Company have developed Winecream – wine ice cream. It combines the best of two worlds: super-premium, naturally sourced gourmet ice cream and craft-made fruit wines. The results are delicious, boozy frozen desserts to help melt your worries away. It’s not the first Winecream to hit the market, Mercer’s Wine Ice Cream, made in New York was released in American shops in 2014, and featured different grape varietals as well is being available in flavours like chocolate cabernet, red raspberry chardonnay, riesling and cherry merlot. How did I not know about this already? The 5% alcoholic treats are strictly for adults. Have fun telling that to a three year old who starts hounding you the minute they spy the tub in the freezer! But carefully disguised in a brown paper bag, I think you can sneak this little beauty into your room for a late night session with ease. It’s only sold online and in the States right now, but don’t despair as we have come up with a couple of sneaky recipes you can make easily at home, so enjoy and cheers! Pour into a rigid container and freeze until firm, about 3-4 hours. Serve in scoops with seasonal summer fruits splashed with a little more sweet wine, (and a little more for good measure). Warm the sugar, cream, and salt in a saucepan over medium heat, stirring occasionally until bubbles form around the edges or until it reaches about 170 degrees. Let the cream mixture cool for a bit and then add the ice wine. Cover the mixture and let chill overnight. Then freeze the mixture in an ice cream machine according to the manufacturer’s instructions. Don’t forget to add more wine if you fancy it! Have a taste and then some more, then leave some comments as to your opinion of wine cream! Please!